This is Matar who recently returned from Cameroon where he had lived as a refugee with his wife and 5 children. 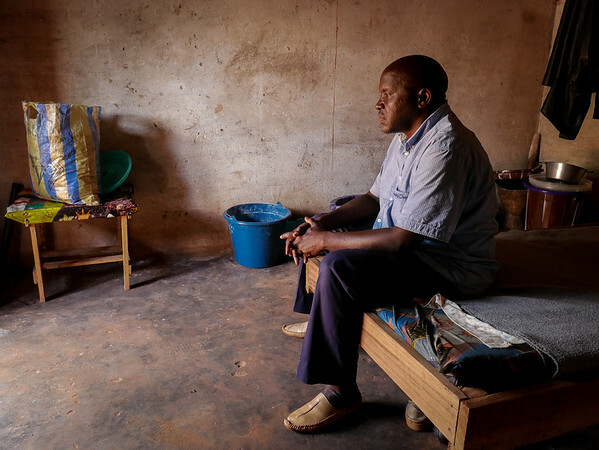 In 2013, he fled with his family as armed groups were deliberately targeting civilians in Berberati, western Central African Republic. For the moment, he decided to return alone. “I came back to see how it is now but it feels like a failure. All I had built is gone. Today, I start from scratch but without my family. I will allow them to come only once I have regained access to our home and that I can earn an income to provide for them.” Prior to the civil war that forced him out, Matar used to earn an average salary of 1000USD/month as an assistant buyer for a diamond dealer. It’s been five years that Matar has not earned an income and that he’s been relying on humanitarian aid and the generosity of relatives. Norwegian Refugee Council has recently managed to get his home back. He is now rehabilitating it before having his family can return to the Central African Republic.